Nothing is bigger than the thrills, shows and games of Six Flags Over Texas. In 2016, Six Flags Over Texas expands Gotham City and lets the villains run wild with the debut of three brand new rides.Or zip around the Arlington Entertainment District on a Segway Tour! That includes an indoor glide through Globe Life Park. If your idea of springtime fun includes getting down and dirty, plan a getaway in February for “Dirt Month,” when the Monster Jam truck rally converges on AT&T Stadium, followed by AMA SuperCross, Professional Bull Riders Iron Cowboy and the American Rodeo. Lest you think the only horses in Texas live on ranches and ride in rodeos, Lone Star Park’s Spring Thoroughbred Season in April will set you straight—and perhaps line your pockets, if you play the ponies right. America’s favorite pastime is the main attraction when the Texas Rangers hit the field at Globe Life Park. Join the legendary tailgate parties on game days starting on opening day in April. Explore the baseball stadium and get your picture taken with Hall of Famer Nolan Ryan—well, at least his full-sized bronze statue in Vandergriff Plaza. Visit Arlington’s top summer hot spot for fun by the gallon. Six Flags Hurricane Harbor features 47 acres of splashy rides, including the zero gravity slide Mega Wedgie and Dive Bomber, a 7-story free-fall experience. Practice holding your breath before you go! Richard Greene Linear Park is home to the Art on the Greene Festival in May, an annual favorite that features dozens of artists from across the country. Take time to stroll around the Celtic-inspired Caelum Moor sculptures while you are there. Arlington pulls out all the stops for Independence Day. Light Up Arlington! features fireworks and entertainment. Tens of thousands of people will line the downtown streets to view 150 festooned floats. Other events draw large summer crowds, too. The Texas Scottish Festival and Highland Games in May entertains visitors at Maverick Stadium on the UTA campus. The festival features Scottish athletic competitions and a lively dance party. Downtown’s popular Levitt Pavilion features free outdoor concerts boasting eclectic artists in many genres. Check out one (or more) of 50 free concerts each year! If it’s fall, it must revolve around football. Tour AT&T Stadium, home of Dallas Cowboys, where you can take your picture on the iconic star at midfield. The stadium also hosts the Goodyear Cotton Bowl and other college football matchups during the season. There is no shortage of Halloween-themed events in town, starting with Six Flags Fright Fest. Expect over-the-top haunted houses and terrifying rides. For a family-friendly Halloween experience, the free Traders Village’s Haunted Hallway in Grand Prairie has a haunted house, a pumpkin patch and lots of candy in America’s largest flea market. Fall also raises the curtain on performing arts season in Arlington when Theatre Arlington and Symphony Arlington kick off new seasons. The holiday season is a special time at Decorator’s Warehouse. Stroll more than an acre of holiday décor with life-sized Santas, gingerbread houses and more Christmas lights than you can count. The Texas Christkindl Market sets up shop next to Globe Life Park. 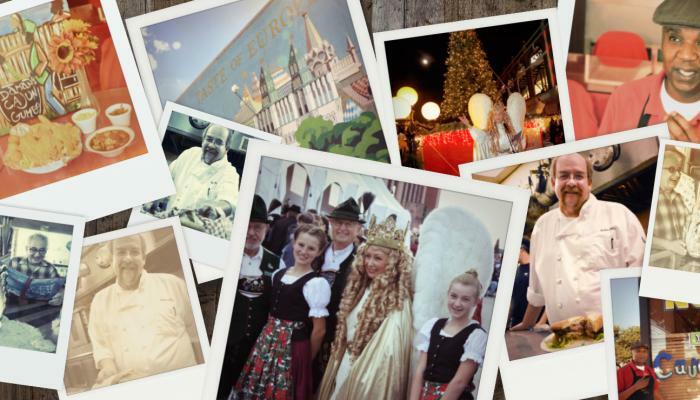 German Christmas traditions thrive here, including a custom-crafted Santa Haus, a marionette puppet theater and delicacies including potato pancakes, gingerbread, mulled wine and really good beer. Get in the spirit with delightful holiday entertainment, glittery decorations and the jolly old elf himself! Santa will make a grand entrance at Arlington’s popular Holiday Lights Parade in our bustling downtown area. After the parade, join Santa for photos and hot chocolate at Levitt Pavilion. Six Flags Over Texas transforms into a breathtaking winter wonderland for its annual Holiday in the Park. Carolers serenade guests, scrumptious aromas stream from holiday-themed food options and, naughty or nice, Santa gladly listens to everyone’s Christmas wishes. This will surely include a return trip to Arlington!